If you own a local business (or any business for that matter), you may be familiar with the “Your Local Listing is Incomplete” phone call. Most of these calls start by mentioning some error (e.g. incomplete Google listing, not coming up in Google Maps, etc. ), and end by saying that, conveniently enough, they are just the right person to help out. Often, the unsuspecting business owner thinks they’re talking to someone employed by Google who, due to their benevolent nature, is reaching out to them (of all people) to help their business out. Rarely does Google come out and tell you exactly what your business needs to do. Here is an instance, though, where we have some guidelines straight from Google. Long story short, if anything, Google will be one of the last companies to call you up offering local listing management help. The opposite can sometimes be true, where working with Google directly can be a time-consuming hassle. Now, it’s true that listings need work. These telemarketers are calling because there is a basic need to ensure your online listings are complete and accurate. What exactly does that mean, though? One of the first things you’ll want to do is check the top Local Listing sites to see if (1) There is a listing for your business, and (2) All the relevant information on that listing has been filled out. SEO-wise, some of the most important sections to fill out are website URLs (often, these are follow links vs no-follow links which will give your website a little boost) and the business description (perfect for relevant keyword search terms). Sometimes, there will be information on your Google Map listing that needs to be verified (phone number, hours of operation, etc.). Simply go to business.google.com, log in to your dashboard, find the error, verify what is or isn’t correct, and you’re good to go. Other times (for example, in the case of a business name change), you’ll need to go through another step to verify the change. It’s as simple as having Google send you a postcard in the mail with a code inside. Entering that code online will verify the change you’ve made. Google is constantly changing its algorithm. By not following Google’s guidelines, missing policy changes, or even having information that Google doesn’t understand, you may see an error. It’s important to keep up with Google’s changes, and follow the standards as closely as possible. Click here to learn about Google errors to be aware of. To do this, go to business.google.com, sign in & see if there is a listing. If there is no listing, create one and send a verification through the mail. Easy. 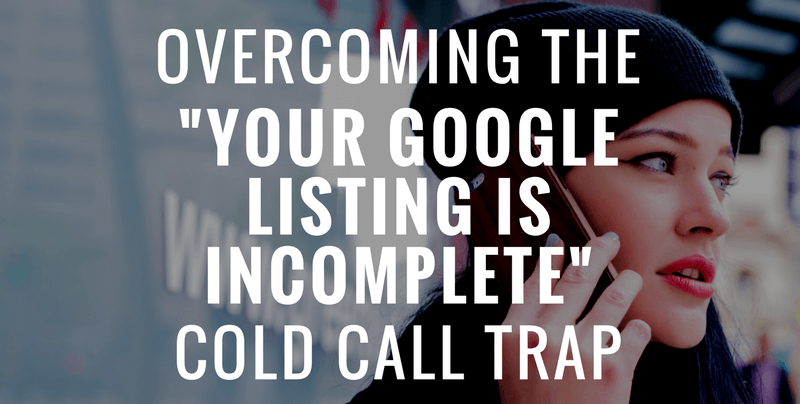 If a listing has been created but not by you, and it has incorrect information, you’ll need to work with Google directly to get it sorted out. While seemingly simple, doing this right has long term effects (positive or negative). Here are two quick examples: Say your business has four Google Plus pages, all with slightly different information. Now, let’s say your business has only one listing created for each of the major Local Listing sites, all with the same business information. In the first example, your business needs work. In the second example, your business is doing well! Just make sure to keep up with any policy changes that may bring up errors, as mentioned above. If either of these are true, there is definitely work to be done. This could go beyond making sure the information on your listings is accurate and extend to SEO work on other local listing sites like Yelp, City Search, YP.com, and your website itself. This doesn’t mean that you should panic, though. We suggest calling your SEO company (assuming you have one) and work with them to make some improvements here. If you’re working with a solid SEO company then most of these should already be taken care of, but it never hurts to touch base and provide feedback. Sick of All the Calls? We get that. Luckily, there’s a relatively easy solution, straight from Google! First, get your business listed in the National Do Not Call Registry. If, after a while, your business continues to receive these telemarketing calls, you can go back to the National Do Not Call Registry and file a complaint. On top of that, now that you know how to deal with some of these calls, you can easily avoid and report Google scams.